As government organizations increasingly recognize the fast growth and expanding influence of social media tools such as social networking sites, blogs, and wikis, they start involving in these tools to increase the value delivered to their citizens. Many government organizations have realized the importance of having corporate policies to guide them while involving in these social media tools. The main purpose of this chapter is to present the key lessons learnt from the process of formulating a government-wide social media policy in the United Arab Emirates. This covers how government officials perceive the adoption of social media by government entities, the main barriers face successful adoption of social media, and the key issues need to be covered by social media policies. The authors analyze the collected answers in light of some of the literature available on the topic. They conclude the chapter with a brief summary and recommendations for future research directions. “Society is in the early phases of what appears to be a media revolution on the scale of that launched by Gutenberg in 1448” The Economist, 20 April, 2006. This selection is another example of the way social media is expanding its influence in our daily life and contribute to make serious changes in our world. In the last few years, social media and social networking sites in particular have expanded remarkably to the limit that social media is now considered the top activity on the internet (Qualman, 2009). At the time of writing, the number of active users on Facebook site only has exceeded 500 million users 70 percent of them outside the United States and they use 70 languages to connect and communicate on the website (Facebook, 2010), this means that if Facebook were a country, it would be the 3rd largest country in terms of population immediately after China and India1! 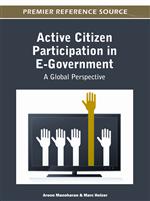 From the e-Governance perspective, the emerge and fast growth of social media represent unprecedented opportunity for the government organizations to expand their abilities to reach and interact with their citizens and promote essential principles of good governance such as openness, inclusiveness and citizen participation. However, these opportunities don't come free of risks and challenges especially in areas like privacy and security. Practices around the world have shown the governments’ need to develop and implement effective policies to utilize social media and hence, maximize the value delivered to their citizens. As Eggers (2005) argues: “today’s technologies can play a crucial role in fixing the problems of modern government, changing how we get to work, how we pay our taxes, how we register our business, and how our kids learn”.